Towns with strict zoning are the best towns, aren't they? They're all about preserving local "character," protecting the natural environment, an dmaintaining attractive neighborhoods. Right? Prevost links this “every town for itself” mentality to a host of regional afflictions, including a shrinking population of young adults, ugly sprawl, unbearable highway congestion, and widening disparities in income and educational achievement. 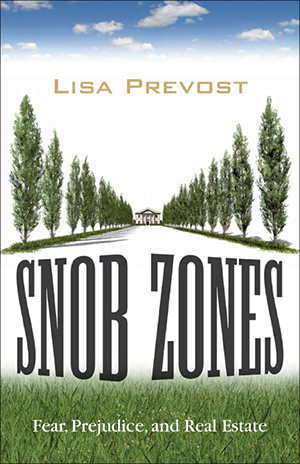 Snob Zones warns that this pattern of exclusion is unsustainable and raises thought-provoking questions about what it means to be a community in post-recession America. "Prevost nicely connects the overarching trend of an ever more expensive housing market with a series of profiles of New England towns determined to bar all but the most costly single-family homes." This book began with a startling display of rude behavior. It was 2005, and I was covering a zoning hearing in Darien, Connecticut, an outwardly refined suburb known for its preppy, members-only mentality. This was a public hearing, meaning that the public was invited to come and complain about the development proposal under consideration. Rare is the human anywhere who shows up for one of these hours-long, weeknight meetings because they wish to compliment the developer. The citizens who do turn out are usually the handful of neighbors who live within view of the building site. But on this particular fall evening, the project in question was objectionable enough to have drawn a crowd of nearly three hundred. The developers received a similarly warm reception. Throughout their presentation, the audience loudly snickered and hissed. Now, this might not have been so surprising in some northern backwater or a scrappy blue-collar burb. But this was Darien, and this wasn’t just some average audience. This audience was made up of people who live in one of the most highly educated, exceedingly affluent communities in the country. These were people who had presumably learned their manners early on and refined them over time at one of the eight members-only clubs in town. And yet, here they were, receiving a scolding from the commission chairman for their discourteous and disruptive behavior. What was it that not only brought out such a large crowd this evening but also brought out the worst in them? What made them feel so threatened? The news article I wrote immediately after that hearing came to a succinct conclusion: Darien residents were furious about a proposal to drop some affordable housing for seniors into an expensive neighborhood of single-family homes. This was the obvious and overarching reason for their ire. File it under the subject line “NIMBYism” and call it a day. * Only this: the reaction that night seemed so out of proportion to the project at hand— twenty condominiums, six of them reserved for moderate-income seniors—that writing it off as simple NIMBYism felt disingenuous. Were people really this incensed because, as they had said, traffic might increase or because emergency vehicles might have a hard time getting in and out of the housing complex? In the years since that night, I have delved much more deeply into the circumstances surrounding this conflict and numerous others like it in towns rich and not-so-rich. I have waded into the hysteria surrounding a proposal for high density cottage housing in a bedroom community more comfortable with five-thousand-square-foot colonials. I have picked through the past of a quiet lake town that, despite its “live free or die” leanings, put a blanket ban on construction of multifamily housing. I have searched for the dividing line between principled opposition and prejudice in a fishing village nearly torn in two by a modest proposal for six subsidized apartments for agricultural workers. I have overstayed my welcome in a summer resort community where moneyed interests use their control of shore properties to keep fishermen and beachgoers at bay. These clashes, laid out here by location, were not hard to find. Nor are they anomalies. These sorts of dramas play out with such regularity in what real estate agents refer to as “desirable” communities that the term “NIMBYism” has become a cliché. In fact, the very frequency of these battles, as well as the predictability of opponents’ arguments, speaks to the assumed entitlement that is the subject of this book. It is a reflection of the widespread belief among homeowners that they have the right to restrict access to “their” community and limit other people’s property rights for their own benefit. What gives them this power? The local authority to write zoning laws for their town. “Strict” is the polite term for what she was talking about. Strict zoning is prohibitive zoning, or what is less politely known as “snob zoning.” This is zoning that blocks or sharply limits development of multifamily housing—subsidized housing, market rate apartments, duplexes—and, in some cases, any residence that doesn’t claim at least an acre of land. It is zoning designed to keep things a certain way for certain people. Homeowners in these towns tend to view multifamily housing proposals as an attack on the sanctity of local control—hence, the overwrought scene in Darien’s town hall. Homeowners have conflated the right to regulate land uses for the public good with the right to exclude—not just uses, but people. Decades of one-size-fits-all zoning and hostility toward affordable housing have gradually squeezed out people of even average incomes from the most prosperous areas, areas with the most employment potential and the highest-performing schools. * NIMBY is the acronym for “not in my back yard.” It is typically used to refer to kneejerk opposition to new development from nearby residents.